support his Boss Buhari by voting for him in 2019 to ensure the continuation of the good works of the party both in the state and in the country at large. According to a statement on Saturday by Ambode’s Chief Press secretary, Mr Habib Aruna, the governor spoke on Saturday in Epe during a meeting with leaders of APC in the division. 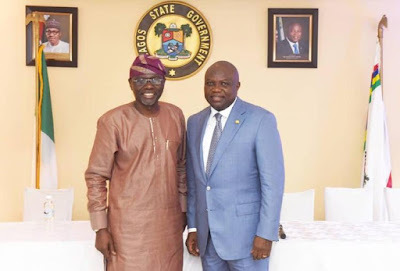 Ambode said it was time for the people to put the events before and after the APC governorship primary in the state which produced Sanwo-Olu behind them, and truly unite for the party’s victory. He said, “All of us are brothers and sisters because this is a close-knit community. It is now time for us to work together for the re-election of President Muhammadu Buhari and election of Mr Sanwo-Olu because Epe cannot afford to be left behind. “I know that in view of what happened, some people are still aggrieved but what I want you to know is that there is no way PDP (Peoples Democratic Party) will work for the development of our division like APC. We are also all aware that for the past 16 years of PDP, they did not do anything in Epe division and it is only the APC that has been transforming Lagos and the country. Also speaking at the meeting, Deputy Governorship candidate of APC in the State, Dr Obafemi Hamzat thanked Ambode and all the leaders in the division, saying the Governor displayed unusual maturity and character which was confirmed that he is a man with a large heart. “I want to thank Governor Ambode for being a man with a large and great heart. What you are doing is unusual and I want to assure you that you have a future and that future will be very soon. We will do everything to protect your interest and that of Epe division. “Governor Ambode has done his best and we will do our best to continue with his legacies and build on what the governor has done to further develop our dear state,” Hamzat said. Meanwhile, Sanwo-Olu, officially launched his campaign on Saturday. He addressed thousands of party supporters in Kosofe Local Government Area. The rally drew people from all the 16 LGAs and local council development areas in Lagos East Senatorial District. Speaking before a crowd of ecstatic supporters, the APC candidate said his administration would construct the much talked about Agboyi Bridge to ease vehicular traffic in the area, while also promising to deliver modern housing scheme for low-income residents. Sanwo-Olu reiterated his pledge to run an all-inclusive government if elected, stressing that his government would listen to the wishes of all Lagosians. He said his campaign manifesto had been redesigned to accommodate requests made by residents. While promising to initiate policies that would lead to employment generation, the APC governorship candidate said his administration would increase the number of primary health centres and expand their operations to cater for more residents in the senatorial district. This, he said, was part of his programme to deliver quality and affordable healthcare in all public-owned hospitals.